Soapstone Aroma Lamps - These hand-carved lamps are approx 4" tall and 3" square with a detachable soapstone top, triple moon on 3 sides. Warm your favorite oil and resins with a little water in these beautiful lamps. 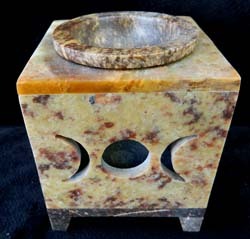 Soapstone colors vary.